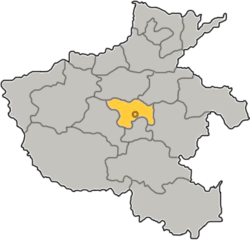 For the county of the same name administered under Xuchang City, see Xuchang County. The prefecture-level city of Xuchang administers 2 district, 2 county-level cities and 2 counties. Xuchang served as the warlord Cao Cao's de facto capital during the late Eastern Han Dynasty. After finding the old capital Luoyang ravaged by war, Cao moved the imperial court and Emperor Xian to what is now Xuchang in 196. In 220, Cao Cao's son and successor Cao Pi officially declared the city as the capital of the newly established state of Cao Wei. The city was renamed "Xuchang" taken to mean "Xu Rising". The Wei emperors held court at Xuchang until the capital was moved to Luoyang in the 220s. Xuchang ranges in latitude from 33° 16' to 34° 24' N and in longitude from 113° 03' to 114° 190' E.
Xuchang has a monsoon-influenced humid subtropical climate (Köppen Cwa), with four distinct seasons. Winters are cool and dry, summers hot and humid, spring begins early and is warm, and autumn is mild and provides a reasonable transition. Rain mainly falls from May to September, as more than 70% of the annual precipitation occurs then. The city has an annual mean temperature of at 14.5 °C (58.1 °F), and its highest average monthly temperature is 27.1 °C (80.8 °F) in July and the lowest is 0.7 °C (33.3 °F) in January. Just over 700 millimetres (28 in) of precipitation falls each year, and there is on average 217 frost-free days and 2280 hours of sunshine per year. Xuchang is an important center of the Chinese tobacco industry. The manufacturing industry the city is best known for is wigs and hair extensions with exports worth about $1 billion in 2016. The industry started around 1900 when German merchants purchased hair from the local area. It was revived in the 1980s and in 1990 a local entrepreneur Zheng Youquan merged a number of smaller hair manufacturing workshops into Rebecca Hair Products, a larger entity that quickly expanded to international markets and became the largest wig maker in the world. Xuchang University is in the city. Famous tourist attractions include Baling Bridge and Chunqiu Tower. On 18 December 2006, the Oromia Region government in Ethiopia signed an agreement with Henan Province to establish a sister city program with Ambo.Bolingbrook, Illinois is also a sister city of Xuchang. ^ a b c 许昌城市介绍 (in Chinese). Weather China. Retrieved 2011-05-29. ^ "China: Hénán (Prefectures, Cities, Districts and Counties) - Population Statistics, Charts and Map". www.citypopulation.de. Retrieved 2 April 2018. ^ "China's Top 10 Most Livable Cities". hnloudi.gov.cn. Hunan Loudi Official Government. 2012-03-28. Retrieved 2014-08-04. ^ "China Focus: Century-old wig industry reviving under B&R initiative". Xinhua. May 10, 2017. Wikivoyage has a travel guide for Xuchang. Wikimedia Commons has media related to Xuchang.